Filet Mignon Steaks - is currently on backorder. You may still purchase now though and we'll ship as soon as more become available. Sometimes you want to whip together a tasty and satisfying dinner. Other times, you want to prepare an awe inspiring, culinary work of art that showcases the utmost in quality and could make a five star restaurant blush. That’s when you need our 100% Fullblood Wagyu Filet Mignon. Considered the ultimate steak, our 8oz 100% Fullblood Wagyu Filet Mignon truly epitomizes the exquisite quality of our brand. The velvety soft texture is accentuated with silky Wagyu juices, creating a decadent treat. It will have the highest marbling content of any filet mignon you can find, adding succulent flavor to its famous tenderness. We always recommend cooking our Wagyu to no more than Medium Rare for optimal experience of the high marble content. Filet Mignon, especially, should be give extra care to not overcook. Filets can be grilled, pan fried, broiled or roasted. Grill: Heat grill to medium high. Sear each side for 1 minute on hottest part of the grill. Move steaks to lower heat and cook for 4 to 5 minutes on each side. Let rest 5 minutes before digging in. Broil: Preheat oven to 425 F. Heat a cast iron skillet over high heat. Add a small amount of olive oil or butter. Season YOUR steak generously with sea salt and fresh ground pepper. Sear each side of steak for 1 minute. Place skillet and steak in oven for approximately 6 to 8 minutes. Let rest 5 minutes before cutting. There are many candidates for the most luxurious, most tender, most outrageous cut. But there is only one winner. Filet Mignon. 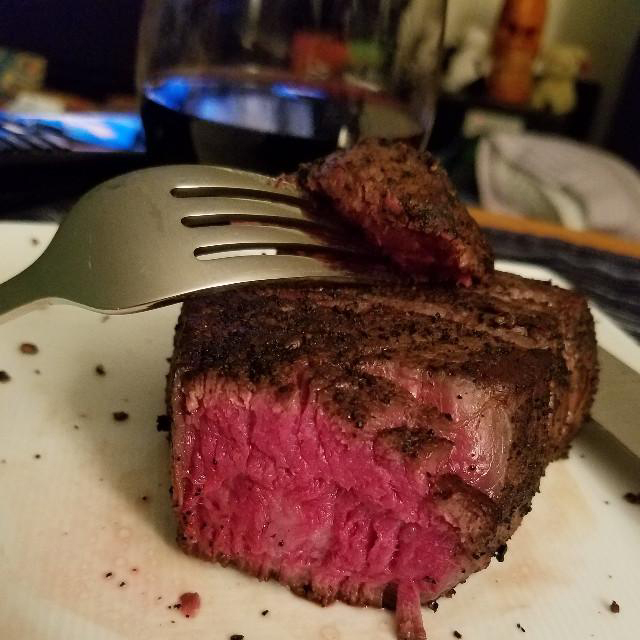 Velvety soft, unbelievably marbled, decadent Filet Mignon. And our Filet being Wagyu, it’ll be the softest, marble-iest, luxurious-est Filet you’ve eaten. Whether you want to sear it, make it into a Wagyu Wellington, or chop it up for tartare, this is the meat you’ve been waiting for. Enjoy.